As posted on the CNY Observers website (direct link). 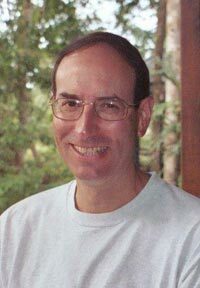 Dr. Stuart Forster (a.k.a. STU – full caps) was one of the THE fixtures in the CNY amateur astronomy scene and his name still comes up regularly, often as part of some pearl of wisdom being imparted to new observers and seasoned members alike (I’ll leave you to read the top of the Stuventory page for more info about STU and to check out links to some of his images on the Syracuse Astronomical Society website). The trials and tribulations of Ryan Goodson and myself to handle the massive equipment collection we’ve come to refer to as the “Stuventory” is olde hat to local observers who’ve kept track of the process from a far. The sorting, documenting, and distribution of the Stuventory has taught us both about how very unique the hobby of amateur astronomy can be when you step beyond the 1Ã—7 mm binoculars in your head and effort the collection of more and more photons. 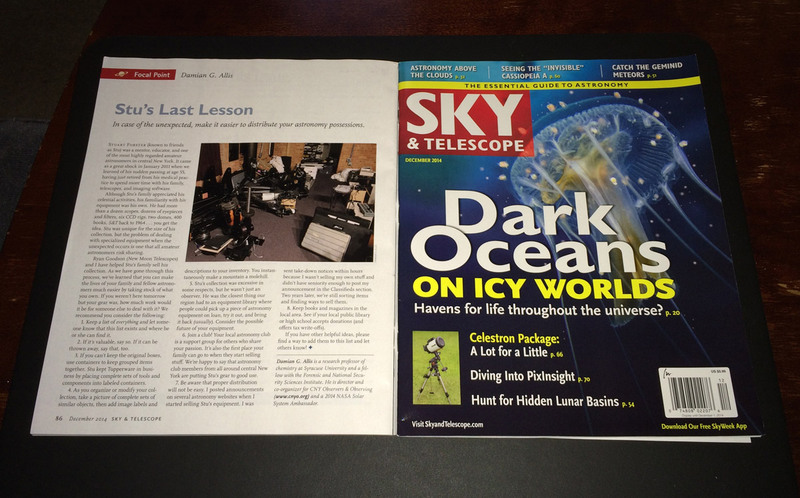 To that end, and to prod others to recognize the complexities of sorting through the mound of gear inhabiting their basements, garages, and domes by those who follow when the unexpected happens, I am honored to have an article on the topic, “Stu’s Last Lesson,” included as the December 2014 Focal Point in Sky & Telescope magazine. The article can be distilled to a single, all-encompassing message – Imagine you not being around to help your family unload your astro gear, then take steps to simplify their lives. Think about all the boxes, hex wrenches, leftover focusers and brackets from your modifications to other scopes, eyepieces (eyepieces! ), cables, controllers, everything, and organize it all, either in a notebook or with a bunch of pics and notes on your smartphone. If you read the article and have other ideas on how to help organize your equipment, by all means let others know (post a comment here, write a letter to the editor with your ideas, start a cloudynights.com thread, etc.). In the meantime, I hope the article gives you the impetus to block out a Saturday afternoon listening to astronomy.fm as you commit your astronomical obsession to pen and paper (or keyboard and monitor). Better still, I’m pleased that readers of Sky & Telescope (of which he had the full collection back to 1964) will learn a little bit about one of CNY’s great amateur astronomers.